← Breakfast With Santa: Get Your Tickets Early! River of Time Holiday Mart! The River of Time Museum offers a look back in time at how the area has changed through the centuries. Not only do they have a wonderful museum that guides you through the exhibit but they also have Docents that tell of how life really was. The gift shop has unique and special pieces that you will want to peruse on the way out. 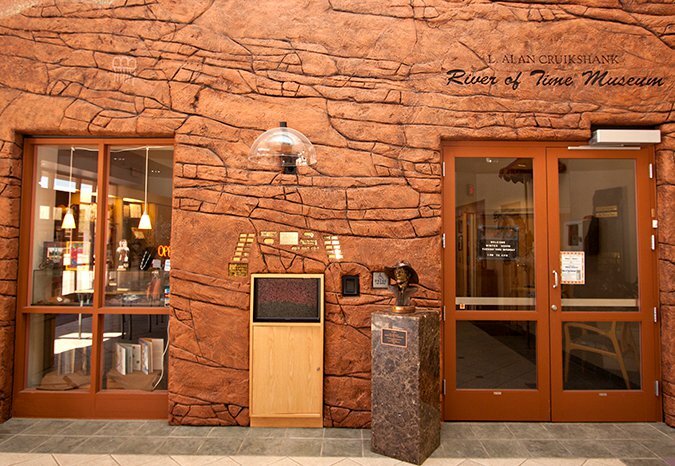 During December, guests receive FREE ADMISSION to The River of Time Museum! To celebrate the Season they have an Open House on December 6th & 7th, 1-4pm with Holiday Music, punch and cookies. The Jolly Elf himself will be there to usher in Christmas on the Saturday. This year their popular Holiday Mart will be starting soon and any donations of Christmas items would be most appreciated. It will be held in the lobby of the library and museum. All proceeds from the sales go to the Museum. The Mart will be open November 18th – December 21st, Monday-Saturday 10 – 4. If you can help with donations to the Mart, they are looking for household items, artwork, jewelry, Christmas and home decor and whatever else you find you cannot use, All are welcome. Check your closets, shelves, cupboards and under the bed! Items may be brought to the Museum now from Tuesday through Saturday, 1 – 4 pm. Please note that they have a receipt form which can be used for your personal income tax. For more information go to http://www.riveroftimemuseum.org/. This entry was posted in Area Events, Arts, Culture, Schools & Clubs, Clients, Customers, Friends & Family, Uncategorized and tagged Fountain Hills Museum, Holiday Mart, River of Time Museum. Bookmark the permalink.